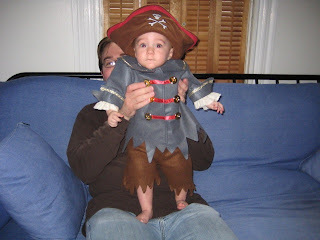 Happy Halloween from Cap'n Blaise! Last time we went to clinic, Blaise weighed in at 13 lbs. 10 oz. (6.18 kg). That was three weeks ago. How much did she weigh today? Rules: Price-is-Right style. Whoever comes closest without going over wins. Answers may be in either pounds and ounces (US) or kilograms. Answers in other units will be accepted, but not converted. Grandparents who have already been told are excluded from competition. Prize: Honor and glory among the readers of this blog. For a full clinic recap, see below. Blaise's stool is completely blood free, even at a microscopic level. She is now off Flagyl and off sulfasalazine. We're down from 14 doses of various meds and supplements daily to 5. We had a good conversation with the fellow about why what we thought was an allergic colitis would respond to antibiotics. We only care so deeply because, well, it worked, but we still like to know and understand these things. We're good to keep introducing new foods with the 5 day rule in place. We've also begun the process of weaning the overnight tube feeds. Tonight Blaise will be on the tube for 10 hours instead of 12 and in a couple of weeks, we'll go down to 8. We saw several friends who were also in for clinic today. One of our old roomies just turned one a week or so ago and is doing great. Another, unfortunately, was getting readmitted. Such is the short gut life. We also met a new friend: a mom whose 4 month old son also has short gut due to a volvulus. She had seen our blog and said "Oh, this is Blaise?!" when we were introduced. I hope that seeing our big girl is encouraging to parents just starting down the short gut path. We drew (and continue to draw) a lot of support from reading blogs about other kids and it's nice be able to pay that forward. Finally, tonight marks a big milestone for Blaise. As of tonight, she has spent as many nights in her own crib at home as she has in the hospital. We were told a long time ago that Blaise might spend most of her life inpatient. It's a good feeling to break even. While poking around the internet for information on how much and when "normal" babies eat (because the doctors are still telling us to feed Blaise "like a normal baby" and we have no idea how such babies eat), I found this baby feeding pamphlet from 1938, published by the Libby's company. When we started Blaise with rice cereal, my grandmother emailed to say that she remembered rice cereal being her kids' first solid food, too. I suspect, however, that the pediatrician isn't going to recommend some of these recipes anymore. Like the one involving raw egg. Of course, then I read a similar pamphlet that is currently distributed by the Beechnut company and wondered how much of it Blaise's kids will laugh at. We had swim class again today and Blaise's enthusiasm was so great that she kind of scared some of the other kids with her splashing. The instructor said "Well, she's got the kicking and splashing thing down." Unfortunately, she has no interest in the other aspects of swim class: blowing bubbles in the water, floating or holding the side of the pool. She just wants to chase the rubber ducks around the pool. I'm not saying I blame her. Ben took some videos, which we'll try to get posted soon. Blaise hit another milestone. It's a dangerous one. She isn't crawling yet, but she did work out how to get from sitting to lying down. Once she's lying down, she rolls. So no more sitting her on the floor for a few minutes and stepping out of the room. We have independent mobility. I didn't actually see this happen. I just left her sitting and came back to her stuck halfway under the changing table. The Flagyl stopped two days ago and so far so good. Sweet potatoes are still a hit, although more as an artistic medium than as a food. As long as some of them end up in her, that counts, right? See the photo site for new pictures. It's fun to think about Blaise being able to experience a lot of different foods. The idea of an Elecare-themed Thanksgiving was depressing. Blaise has been eating like crazy and pooping a lot less. (Blood in the bowel triggers movement.) I have my fingers crossed for her weigh-in at clinic on Thursday. She's finally started to outgrow the three-to-six month sizes and nine month clothes aren't ridiculously big on her anymore. So she at least seems bigger. Blaise turned 8 months "corrected" on Tuesday (eight months from her due date). It's still strange sometimes to have a baby whose development is spread out over a big span of time. In some ways, she's definitely about 8 months. In other ways, she's more like her birth age. In still other ways, she's ahead of both and in a few more ways, she's behind. I gave up completely on the baby books a long time ago. Blaise is Blaise and we have to trust her therapist, her doctors and our own instincts to tell us whether she's on the right track for her. The big developmental change lately has been increasing focus on goals. If she gets in her head that she wants to roll onto her belly and look at a label on her changing table, she'll do it, even when she's partway through a diaper change. Of course, we can't get her to stay on her belly any other time. Her tube is an endless source of fascination and she actively searches for it when we hide it from her. We try reasoning with her. It doesn't work, so she just drives us crazy. Another of those things that's good in the big picture (who doesn't want a goal-oriented kid?) and trying in the moment. She's also developing an interest in other babies. She gets very excited about the photos of friends' babies on our fridge and had a good time playing with the other kids last night at our parent group. Otherwise, things are good. Today is Blaise's last day on Flagyl and we're going to check in about the plan to discontinue the sulfasalazine. You all take me way too seriously, as I've heard a number of speculations about what "D" food we would try next. "A" was apples and avocados. "B" was banana. "C" was carrots. "D" was sweet potatoes. They're a hit. When Blaise was first out of the hospital, we went to visit some friends. While we were there, Blaise spit up a bit. At the time, she was on AquADEKs vitamins, which we have since stopped because they were causing her colitis to flare up. We were also pretty sure she wasn't absorbing them properly because they turned everything, especially her spit-up, bright atomic pumpkin orange. These friends are very unflappable people and, faced with bright orange baby puke, just calmly asked "Why is it orange?" We explained. No big deal. Yesterday I had Blaise in lab with me and she spit up a bit. This time, when my colleague asked, "Why is it orange?" I was able to give a much less exotic answer. "She just ate some carrots." I like that answer better. I know what you're thinking. "Ho, hum. Another photo of Blaise smiling in her high chair." Look closer at the food smeared on her chin. Notice anything? Me: We haven't seen blood since late Friday night. GI: She started the Flagyl on Friday? GI: Well, huh! I wish we had started that ages ago! Me: One hypothesis at a time. GI: Right. I guess the real test will be what happens when we take her off it. Me: So can we restart solids? This isn't something I've ever done, but I'd like to ask for some help for another family that could use a little bit. Gavin is a handsome three-year-old boy who has mitochondrial disease. Mito basically causes cell death and can lead to the loss of entire organ systems. In February, Gavin had his entire intestine, as well as his gallbladder, removed to reduce the number of infections he was having and improve his quality of life. That's right, removing those organs improved his quality of life. He is wheelchair bound and TPN/Omegaven dependent. He's been going through a very rough stretch, with frequent transfusions and line infections. Beyond all of this, his family lives in a second floor apartment, so his mom or dad has to carry his chair and all of his pumps/tubes/drainage bags down a flight of steps if they're going to leave the house. The wonderful thing about this family is that they do leave the house. They go to the YMCA and the park in between their many visits to the hospital. They are really doing their best to live a full life in spite of all of the medical crap, but the older and more complicated Gavin gets, the harder it's becoming for them. They're working with an amazing group to take a house and rehab/renovate it to make it fully accessible for Gavin. This group, called Erin's Dream (different Erin), uses as much volunteer labor and donated material as possible, but they also need a good bit of financial support. I know things are tight for a lot of people these days and that there are a lot of kids and families who need help, but if you find yourself with a little extra, this is a really simple way to help one family. Here's the link for donations. If you want to read more about mito, click here. For Gavin's blog, go here. Thanks for putting up with my heartstring-tugging. In her last post, Erin alluded to a new adventure Blaise would be undertaking today. Having returned from said adventure, I'm happy to say it was a great success: Blaise LOVES swimming! Her parent-infant class meets once a week at the MIT Athletic Center. 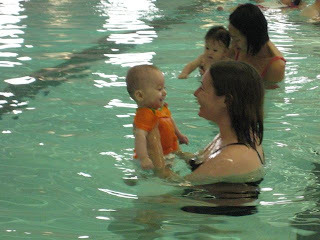 Class lasts about 25 minutes and is a very low-key introduction to the water for little ones betweek 6-18 months. 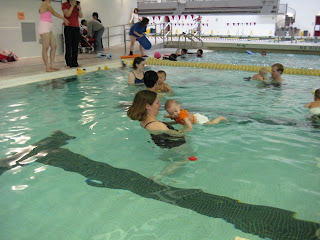 The pool at the Z Center is great and as you can see Blaise had a great time splashing around with her mom. We went into the whole thing figuring there was a not-small chance she might just freak out and not have a great time being in the water...you never know, right? Either way, we figured it was definitely worth the new experience. The end result was just a ton of fun all around. Blaise was cool as a cucumber while she was getting into the water and only hesitated a little bit the first time her face got splashed. Any wariness she may have been harboring gave way rapidly to the realization that she could splash around in the water like a wild child. She spent the whole class waving her arms and legs around like mad and giggling away at Erin blowing bubbles at her under the water. What about the tube? Not really much of an issue as it turns out. It's sealed tight at her belly, so not much of anything can get in, and all we did was put her in a t-shirt so the other parents didn't freak out at the sight of large abdominal scars and a plastic appliance. She also now has some adorable clownfish swim diapers that unfortunately had to get covered up with a vinyl diaper that the Z center sells. Chalk this up as another really fun, normal thing we can do with her...we're just hoping she keeps enjoying it so much. I swim like a brick (I'll even go so far as to say like a dead brick) so I'm particularly excited to have Blaise be comfortable in the water. So that's what we're going to be doing with our Sundays for a while to come. Hopefully we can get some Blaise & Dad time in the pool soon, or at the very least Dad can hit the track while Blaise hangs out in the water with Mom. Blaise went to see her pediatrician for a well-baby checkup yesterday. We love our pediatrician. He's smart, friendly, good with kids and always makes us feel good about how Blaise is doing without just telling us what we want to hear. After a discouraging clinic visit, it was good to talk to someone who thinks our little rock star is a little rock star. He was even able to explain a bit more concretely why the antibiotic might help the bleeding even if we haven't identified an infection. The doctor commented more than once about how strong Blaise is and he was considerate enough to not draw blood, even though that's standard for the 9-month check-up. Blaise had blood drawn 3 weeks ago; she'll probably have another draw soon. He thinks it's fine to wait until they're drawing for another count anyway instead of sticking her twice. (Did I mention that we love this guy?) A quick flu shot later and we were out the door and home for a nap. Blaise has been hilarious the last day or two: mugging for the camera and giggling hysterically over nonsense words (e.g., peef and dax). We're embarking on a new adventure tomorrow. Hopefully, she'll have fun with it. So. We were in for clinic today and we were feeling good about life. We hadn't seen hardly any blood over the last week or so (the occasional speck, but we can live with that). Blaise has been eating a lot more, sometimes giving me a "that's it?" look at the end of a bottle. Everyone should be happy. First, the weigh-in and other measurements. She's at 13 lbs. 10 oz. and 25.5 inches. Her weight is up, but it's not as up as we'd like it to be. She's fallen off that 3rd percentile growth curve she was clinging to. In reality, no one follows a perfect curve and starts-and-stops are to be expected, but no one wants to see this continue. Ideally, she'd be gaining faster and we could start to reduce the overnight tube feeds, but for now we're just going to try to get her to eat more by mouth. Hey! I have a great idea! Since the blood is lessened, let's give her some new foods, which would add some calories. That's what the nutritionist had in mind. That's what the GI had in mind. That's what we had in mind. Then she pooped blood during clinic. Well, crap. Now new food is still on hold, at least until next week. We're stopping the steroid enemas because, honestly, they didn't seem to be doing much. We're sticking with the oral anti-inflammatory medicine and adding Flagyl, an antibiotic. Blaise hasn't tested positive for any bad gut bacteria, but we sent another culture for c-diff today. I guess even when they can't identifiy a specific bug, sometimes antibiotics help. At least she had the bloody stool during clinic and not 3 hours later when we had been told that all was great and full speed ahead. I was also starting to get paranoid that her GI thought we were crazy because he had never actually seen blood in her diaper. So now he knows we're not crazy. At least, not crazy in a making up medical symptoms kind of way. It's hard to not feel a little defeated because no one knows for sure what's causing this or how to treat it. It will lessen and then worsen for no apparent reason. Adding the new antibiotic to Blaise's med schedule puts her at 14 oral/tube doses of meds or supplements daily. We need a spreadsheet to keep track of them all. If the Flagyl doesn't help and all the cultures remain negative, they'll want to do another colonoscopy. I know it could be worse. It could be a lot worse, but I still don't have to like it. As usual, if you didn't read this blog, you would never know to look at Blaise that anything is up. She's active, cheerful, eating, sleeping and babbling up a storm. Her phoneme inventory exploded last week, going from just b, d, w to include m, n, g, l and several new vowels in the space of about three days. She enthusiastically joins conversations as well. She's just a happy, generally healthy baby who happens to have blood in her diapers. We made it to Pittsburgh. We made it home. We had fun in between. Blaise had a great time being adored by grandparents and other friends-and-relations. She met her great-grandparents on Ben's side as well as two great-uncles and a great-aunt, played with her dad's old baby toys and slept through both flights. Blaise seems to be an easy-going traveler, which bodes well for future trips to see family as well as a return to our academic vacation habits (i.e., conferences in cool places). First, if Grandma Janet has jewelry on, try to steal it. Second, people who look just like Grandma, but older, are great-grandparents. They're lots of fun. Also, the rings-on-a-stick toy is fun for all ages. Finally, camouflage is very helpful for sneaking up on sleeping dads. We had fun, but we're glad to be home. More pictures are up on the photo site.